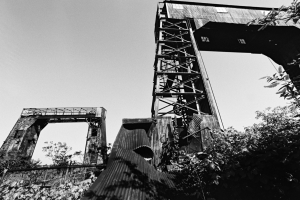 In the South Bronx neighborhood of Port Morris, a pair of ferry gantries deteriorating in an empty lot may seem an eyesore to some, but the Friends of Brook Park sees them as the centerpiece to an engaging public space. Taking inspiration from other New York City waterside parks, this new park will combine recreation, education, and preservation of New York’s history for residents and visitors alike. 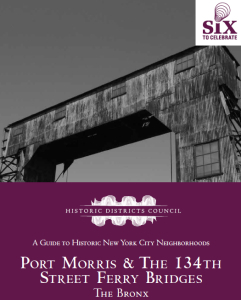 We have a long engagement with our South Bronx waterfront and shoreline and have identified the gantries as a striking visual reminder of the rich history of Port Morris and a strong bridge to a revitalized future. The gantries of Long Island City and Manhattan’s Upper West side have each in their way served as anchors for their respective locations and our community has a cultural heritage with aspirations and deserves no less. Recently this initiative was selected by the prestigious Historic Districts Council as one of their “Six to Celebrate”. The two gantry crane structures occupy a site on the East River between 134th and 135th Streets, in the Bronx, New York. 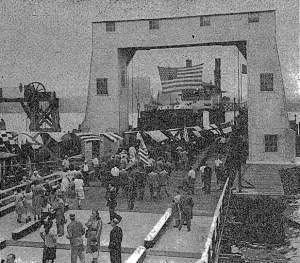 Beginning in the late 19th century and continuing for a number of years, ferry services to North Brother Island and North Beach, Queens operated on the site. A portion of the property was used by the New York Police Department to house marine vessels. The property is now vacant and ripe for community use. The vacant status of the site endangers the structures by exposing them to vandalism, material decay and corrosion, as well as inappropriate and out of scale development owing to their desirable position on the waterfront. The structures date from an important and unique era in the history of the Bronx, and are representative of an important waterborne transportation method. Furthermore, the site offers a concrete thematic connection to the disappearing human history of North Brother Island, which has had an important role in larger New York City. For all these reasons, and those yet to be enunciated, we are endeavoring to document and publicize the site and avail it of all relevant historic designations and resources. Joins us! Sample letter of support here YOU can fill out!